One more software question - FTP Voyager 6.0.0.5 - more freeware - supposed to have an Explorer-like interface. There are so many FTP software packages out there - I have no idea which one would be best. Any recommendations? I do agree there is many many good FTP programs out there. As Tony-san said i like cute-ftp and i have used ws_ftp and a few others. The Top 3 FTP programs in my book are. # 1 & 2 are shareware and worth it. #3 if you use the stardard version is free but lacks some serious power. The software you are talking aobut isFTP Voyager version 6.1.0.1 is out. Has a cost of $38 I have used it before and it is a windows explorer interface! But I really didn't like it compared to Cute or Bullet. I do have some FTP to FTP software which is good for moving sites and large amounts of data. But not really needed in this thread. i hope this helps you some. But consider that 56K modem first !!! Thanks guys - for all the info. This is The place to go for technical help! Hope you guys don't decide to start charging! Here are a couple screen shots of Bullet Proof FTP. Try FTP Manager Lite. It is an excellent free FTP and SFTP client software. The clean interface is super easy to use. For a GUI I like FileZilla. It works and it's free. I think it stores passwords in plain text so I wouldn't let it do that. Worth checking out. I think this forum might be either misconfigured or hacked. 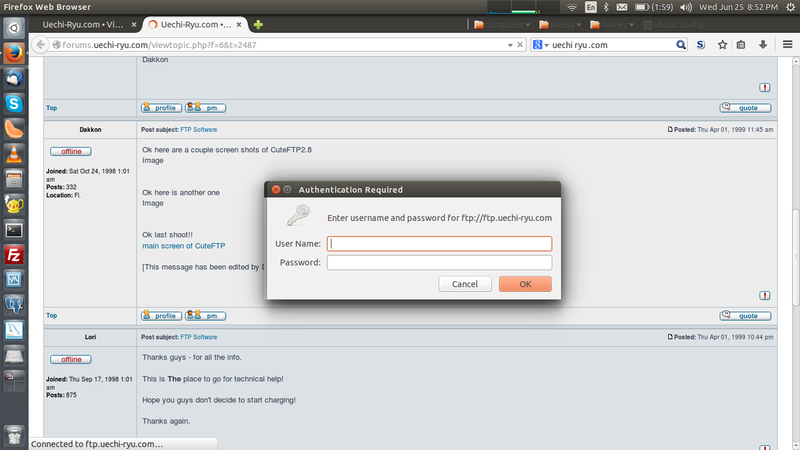 On Ubuntu / Firefox I get a pop up asking me for your sites credentials. Anybody else seing this on this page? I suggest your site admin look into it. Off topic, sorry about the overly large image above. I didn't realize I could post an image that would break the site's CSS. FWIW that could be fixed as well.